Mulching serves several purposes. It provides temperature control for the soil, helps to retain moisture, reduces weeds, protects plants from disease, and, when organic mulch is used, it improves the soil texture, adds nutrients, and encourages earthworms. Rubber Mulch: Rubber mulch provides several advantages over plant material based mulches. For landscaping and gardening purposes, both nuggets and buffings insulate soil from heat allowing a 2 or 3 degrees F higher soil temperature difference over wood mulches. Rubber mulch is beneficial for soil moisture as rubber is non-porous and does not absorb water on its way through to the soil. It also reduces fungus growth and plant growth, and becomes a weed barrier as weed seeds dehydrate in the mulch before reaching the soil. Neither nuggets nor buffings provide any humus to compacted soil types. Rubber mulch seen with playground equipment in the background. Another advantage over plant-material mulches is its elasticity, which gives it a springy quality when used in a fairly thick layer. This makes it a natural choice for playgrounds, where the extra springiness provides additional safety for children when they fall off of playground equipment. 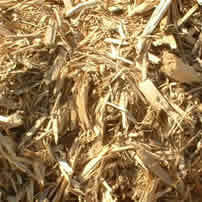 Tests have shown rubber mulch is superior in breaking falls to traditional bark mulches. The International Play Equipment Manufacturers Association has certified some rubber mulches for ASTM F1292-09. It can be 97% wire free for landscape use and 99.9% wire free for playgrounds. Rubber mulch is also becoming a product of choice used in horse arenas for footing material when mixed with sand. It can be found in nugget or shredded style. Rubber mulch is seen as an effective and safe alternative to wood mulch, reducing the regional and global carbon footprint by reusing materials that would otherwise end up in landfills. Its durability can be up to twelve times greater than wood mulch- with wood mulch lasting an average of four seasons- as it doesn't deteriorate over time. 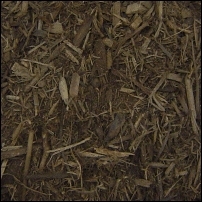 Cypress Mulch: A popular mulch for those looking for a light yellow color. The freshness and aroma of the cypress brings alive any planting area. This mulch contains long slender fibers of cypress wood. Some say this mulch is resistant to many insects and unwanted bugs. This mulch will last for many years. 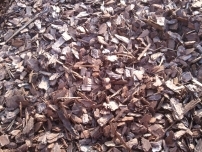 Cypress Chips: This square cut cypress mulch works great for play areas and other landscaping needs. The cut allows for maximum safety protection from splinters. This cypress is clean and consistent in size. The yellow color also distinguishes this mulch from any other. 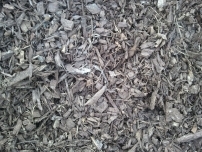 Red Oak Mulch: Double ground red oak hardwood. Double ground means that it has been processed twice as compared to the mixed hardwood which has been processed once. Great for any use around the home or business. Adds the ability to hold tight to strong slopes or sharp declines. Also great for natural looking walkways through your garden. 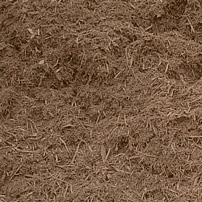 Pine Mulch: This fine shredded mulch will add needed nutrients to any soil. This mulch is great for new planting areas because it will introduce the soil to new organic fibers and nitrogen. It has a reddish color and also a fine consistency that provides for a neat and smooth look when applied to any surface. Mixed Hardwood Mulch: A cost effective choice. It has been single ground, thus producing larger wood fibers with a variation in sizes throughout. Not as fine as the Red Oak but it works just as well on hills or any other mulching area. Also called a hill-hugger for it's ability to hold tight to surfaces. This provides a good coverage for trapping needed water in the soil. 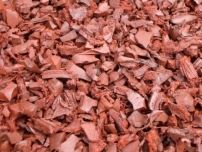 Decorative Brown Mulch: Made from recycled wood pallet fibers it receives a environmental friendly dye that fully coats this decorative mulch. It really works well with those flower beds or natural areas with a lot of green plants. This contrast is very popular among our customers. Decorative Red is a consistent mulch in size and texture and is clan of debris. Decorative Red Mulch: A festive color of red that is sure to awaken your yard with vibrant color contrasts. 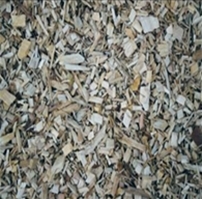 Made from recycled wood pallet fibers it receives a environmental friendly dye that fully coats this decorative mulch. It really works well with those flower beds or natural areas with a lot of green plants. This contrast is very popular among our customers. 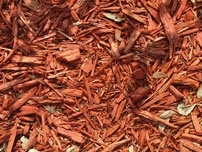 Decorative Red is a consistent mulch in size and texture and is clan of debris. 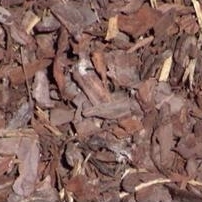 Large Nuggets Mulch: Large 3.5 to 6 inch bark pieces that will outlast almost any other mulch. Provides a deep texture top a planting bed. 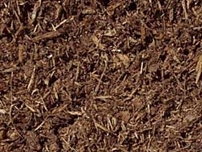 With a light brown color this mulch will blend in to any natural area or flower bed. Mini Nuggets Mulch: Very popular look with small bark chips. Taken from pine trees this mulch allows for a different look than most fiber based mulches. Easy to work with and to apply. Contains 0.5 inch to 3.5 inch bark pieces. Light brown in color. 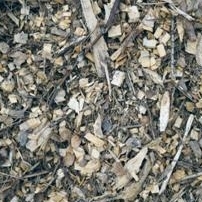 Wood Chips: Local chipped wood. Affordable price. Various wood. Pine Straw: This is very common in the southeast. As a groundcover pine straw can be used to cover large areas of landscape at an affordable price. The reddish brown color also offers great contrast with most plants and shrubs. One bale of straw can cover any where from 35 sq ft to 100 sq ft depending on how thick you place it. Wheat Straw: This can be used to set a new lawn when planting seed. It can also be used for various projects when erosion control is needed. A mulch of wood shavings, bark, straw, dried lawn clippings, leaves, sawdust, or pine straw will help conserve moisture and keep down weeds. To be effective, the mulch must be applied between the rows and around the plants. Do not apply mulch to the garden too early in the spring; soil needs to warm up. Mulch will block the sunlight and the soil will remain cool and retard early plant growth. Wait four weeks after setting transplants before applying mulch. Such a mulch is valuable around unstaked tomato, cucumber and bush squash plants to keep the fruit from contact with the soil. Mulch should be about 2 to 4 inches deep after it has settled. The mulch material can be raked off after the gardening season and re-used, or it can be spread over the area and worked into the soil. If much decomposed material is added to the soil, use some nitrogen fertilizer on the surface before spading it under.